In 11th century Europe, the most coveted throne of all was that of England. Contested on three fronts, Viking, French and Anglo-Saxon it was a time of war and political turmoil. Torkil, an Anglo-Saxon thayne is a vassall of Harold Godwinsson, Earl of Wessex and the most powerful man in England. Harold is positioning himself to take over the crown once King Edward has died and is gaining favour throughout the realm as the most suitable heir. With Harold he has to negotiate the release of Godwinsson family hostages held by William, Duke of Normandy - another claimant to England's crown. Ivar, is a slave to Harald, a Danish prince. He rises from nothing to a position of trust and becomes a feared warrior who becomes one of the Emperor of Turkey's elite bodyguards. When the time is right, he will join with his Master to make their own bid for the throne of England. 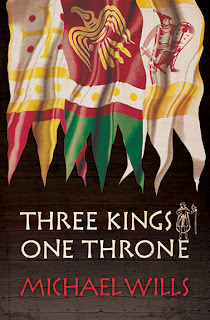 Told from these two perspectives "Three Kings, One Throne" ventures across early medieval Europe telling how one of the most bloodthirsty eras came to shape our world today tells the story of two warriors and how their destinies entwine. There are many tales set in the backdrop of the short reign of Harold Godwinsson and nearly all are written for an purely adult audience. Michael Wills has written a beautifully simplistic story for young adults which entertains and educates at the same time. It is not as puerile as my own school history lessons were, which basically consisted the telling of a battle where a king had an arrow stuck in his eye before the Normans took over and a long tablecloth was stitched telling the story! Michael Wills has done some breathtaking research and constructed a novel which gives enough of the brutality of the age without causing nightmares to the reader. It is colourful and rich, the descriptions of the various cities in which the action takes place is vivid and helpful annotations explain to the reader where places are or describe items that may be unfamiliar. If you want to inspire a teenager to read about 11th Century England and develop an interest in history, I cannot recommend this book highly enough. It does have elements that are probably a little too mature for any young person under the age of 13, but nonetheless it is pitched perfectly to educate and entertain a teenage audience. 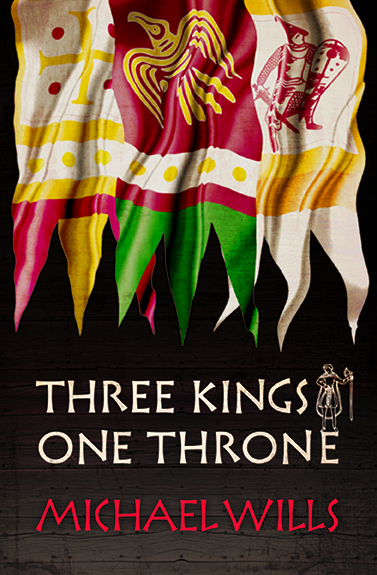 I give "Three Kings, One Throne" 5 Crosses!